Yesterday, Corporate unveiled a new brand name for its digital marketing services unit, in a press release with this headline: "New Branding Signals Gannett’s Evolution as a Full-Service Media and Marketing Company with Suite of Best in Class Digital Products." "Gannett is a leading international media and marketing solutions company, delivering best-in-class content and services across an integrated, multi-platform portfolio." -- Annual Report to shareholders, Jan. 2, 2013. "The mobile team is responsible for developing a strategy for delivering best-in-class mobile solutions scalable throughout multiple Gannett companies including USA Today." -- job description, Aug. 6, for a senior HTML5 developer. "Our continued laser-focus to build best in class products and content will keep them coming back." -- Publisher Larry Kramer, April 30, on The New York Times passing USAT in circulation. "During her time at Gannett, Roxanne has been instrumental in helping Gannett recruit and retain top-notch, best-in-class talent." -- CEO Gracia Martore, May 1, 2012, announcing the retirement of HR chief Roxanne Horning. "This is an exciting time for Gannett, as we leverage our many competitive advantages to deliver best-in-class content and services across an integrated, multi-platform portfolio." -- Martore, April 12, 2012, in a press release announcing an executive appointment. "It is a privilege to run Gannett Broadcasting because thanks to a group of best-in-class professionals, we are exceptionally strong." -- Broadcasting President Dave Lougee, Feb. 22, 2012, speaking to Wall Street analysts during a conference. "Both of us were brought in to build centrally best in class capabilities." -- Chief Marketing Officer Maryam Banikarim, referencing herself and Chief Digital Officer David Payne, at the same February analyst conference. "This is an exciting opportunity to help build and motivate a high performing, integrated, best in class, corporate communication function at one of the largest and highly respected media organizations." -- Corporate, Nov. 17, 2011, in a job description advertising for the company's next head of public relations. "We have to prioritize our efforts and focus on the digital products and services where we can be truly best in class." -- Chief Digital Officer David Payne and others, Oct. 6, 2011, announcing the shuttering of Moms Like Me. "HighSchoolSports.net will offer national and local advertisers an exciting, best-of-class vehicle to reach teens and parents." -- Gannett Digital Ventures President Jack Williams, Oct. 17, 2007, announcing that website's purchase. "We are best in class. Kindergarten class." Kinda related: the very funny mocumentary Best in Show (2000); watch the trailer. Really extending the dog show metaphor, the company told shareholders in the 2010 Annual Report: "Recent innovations include dynamic ad creation solution AdControl, creative tool AdArchitect, interactive in-stream video ads, mobile rich media ads and several other best-of-breed technologies." And again in the 2008 Annual Report: "Ripple6 is a wholly owned subsidiary of Gannett and will continue to offer its best of breed social media technology and analytics not only to Gannett but also to an array of top-tier marketers and Web publishers." Is there a Westminster Kennel Club for the advertising industry? 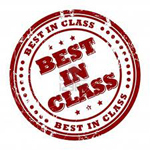 "Best in class" is like radio and tv stations that declare themselves "your official weather station". Who gave them that designation? They gave it to themselves. Most people see right through that for exactly what it is ... horse puckey. This actually happens all the time around USA TODAY. You hear the same jargon over and over from all around the company. Once a new phrase is introduced, you can bet you'll hear it on conference calls and town meetings and read it in e-mails. Remember when "lean forward" was being used all the time? Bunch of parrots and robots incapable of original thought. Here's another one they've been tossing around lately: Let's play to win.